The Bimota YB1 wasn’t originally called the YB1 because it predated Bimota’s traditional naming conventions. Internally, it was known as the Yamaha-Bimota Gran Prix ’74, but later became known as the YB1, the very first Yamaha-engined Bimota. In fact, it was the very first series-production Bimota, if something built in numbers this small can be considered “production.” Powered by either the 250cc or 350cc version of the TZ’s liquid-cooled parallel-twin engine, just twelve of these distinctive and very fast little machines were built. 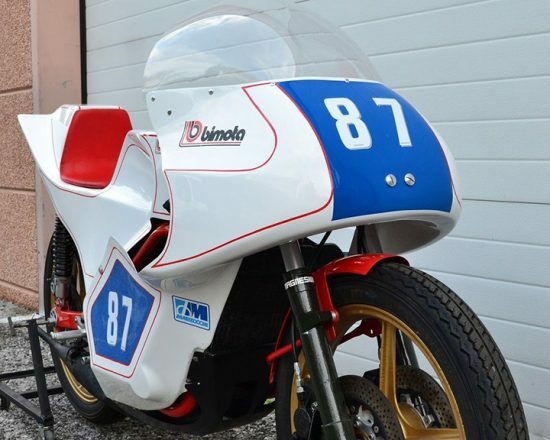 The bike’s racing success helped pave the way for Bimota’s later, more well-known racing and road bikes and helped to establish BiMoTa as a manufacturer. It’s quite literally possible that, without the YB1, there’d be no Bimota today at all and the face of motorcycling might look very different. 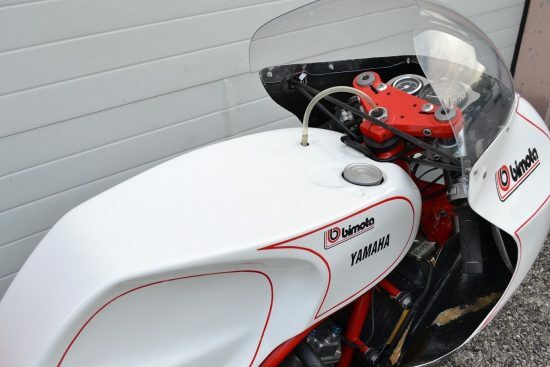 Built between 1974 and 1975, the bike included Bimota’s signature racing touches: one-piece bodywork that allowed easy maintenance, a stiff and lightweight tubular frame, adjustable ergonomics, and even a clever eccentric chain adjuster. 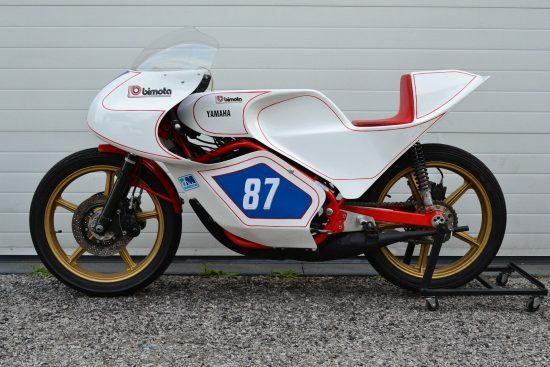 This is an iconic superare YB1, the first race Bimota with Yamaha TZ competition engine. It was also the second Bimota race model ever built (the first was the unique Paton Bimota) and definitely the first “true” racing Bimota as this model was raced by important names as Lucchinelli, Riondato, Ceccotto, Gallina, etc. This frame was built to be fitted with both Yamaha options 250cc and 350cc, this one is a 350cc. Only 12 units were built making this model extremely rare, desiderable and collectable. This bike was last paraded at the main Italian event in 2012, kept in collection completely dry since. The paddock stand in pics is coming with the bike. Another one from our new best friend “Gianluca” who always seems to have the very coolest bikes for sale! Bidding is up to just $4,550 with the reserve not met and several days left on the auction. 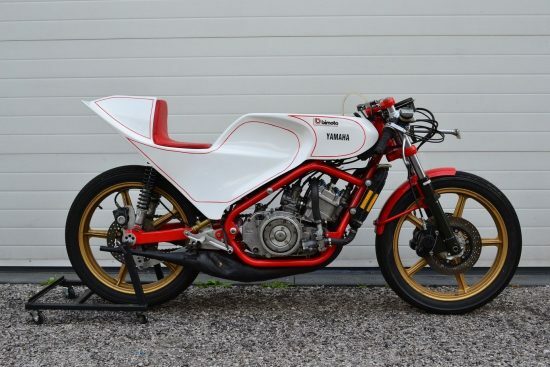 I honestly don’t know what this little exotic really should be worth, but it’s one of just twelve built, looks wild, and as an early Bimota is certainly historically significant. 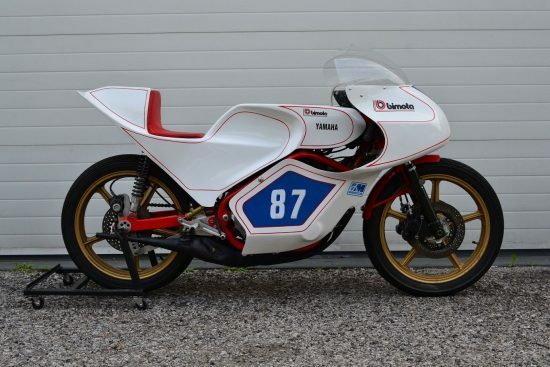 The YB1 was available as a kit bike, and supposedly very few were sold with this distinctive bodywork, making this zero-mileage example even more of a unicorn, literally ground zero for the modern sportbike. WOW is all I can say! Gianluca is certainly “schooling us” with all these exotic motorcycles.